Concrete Milling in the Restoration of Concrete. | Blackwell's Inc. Concrete Milling in the Restoration of Concrete. It was used extensively during the Roman Empire and freed the Romans from having to use stone and brick material in their construction projects. Concrete, as the Romans knew it, was a great advancement in construction engineering. It was so advanced that, even today, the concrete dome of the Pantheon in Rome still exists. Concrete seems like it can last almost forever. So what if you need to remove concrete? There are all types of ways to do that. The list would include concrete saws, demolition hammers, concrete crushers, mounted breakers, and many others. These methods all serve to break up the concrete for removal. 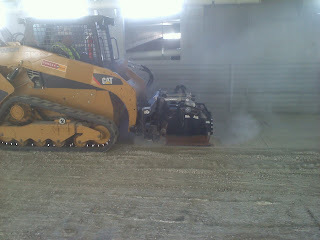 Concrete milling machine removing about 5/8 in. of concrete in each 36 in. pass. But what if the concrete is too high or not level in places? Or the concrete slab is in poor condition and requires the surface to be removed for flooring restoration? Well, a concrete grinder will work, but a milling machine uses the pummeling action of multi-tipped cutting wheels to chip away the concrete surface much faster and much more aggressively than a grinder. This milling machine (pictured) is what we used for the bulk removal of over one inch of concrete from this 5600 square foot parking deck. Each pass of the machine removed 5/8 in. of concrete in a 36 in. width. The owners now have a choice of finishing options for the parking deck.